Just in case you were curious: Can Ted "The Tube Man" Stevens Even Get His Own Vote? Can Ted "The Tube Man" Stevens Even Get His Own Vote? 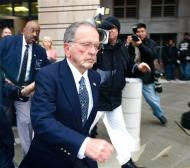 The jury came back in the Ted Stevens federal corruption trial with Stevens being found guilty on all seven counts of "making false statements on Senate financial documents". This makes Ted Stevens, the longest serving Republican senator in the history of the United States, a convicted felon. Now I usually get some weird voyeuristic pleasure watching any politician get caught doing something dumb. The greater the irony (I'm looking at you Rep. Mahoney) the more fun it is. However, Stevens holds a special place in the hearts of most geeks having single handedly renamed the Internet to "The Tubes". For totally irony points though, I think the absolute pinnacle would be that with his conviction coming just eight days before his hotly contested senatorial seat is up for grabs Stevens may not even be able to cast a ballot for himself. In the United States, conviction of a felony carries collateral “civil” consequences apart from penal sanctions such as fines or imprisonment. Offenders may lose the right to vote, to serve on a jury, or to hold public office, among other “civil disabilities” that may continue long after a criminal sentence has been served. While both state and federal law impose civil disabilities following criminal conviction, state law governs removal of the right to vote even if the conviction is for a federal rather than state offense. I'm not sure what the laws are in Alaska pertaining to felony disenfranchisement, but if there is any karma in the universe, Stevens may very well lose by the single vote that he couldn't cast himself.